MANILA, Philippines - Department of Education (DepEd) Secretary Armin Luistro on Monday, September 8, 2014 said that the proposed salary increase by teachers' group Alliance of Concerned Teachers (ACT Teachers) is more realistic than other proposals. "Alam ko po na dun sa mga isinusulong na iba’t ibang mga numbers, yung sinusulong po yata ng grupo niyo ay yung mas mukhang conservative and realistic,” Luistro said to ACT Teachers Representative Antonio Tinio during Monday's hearing by the House of Representatives’ Committee on Appropriations on the proposed 2015 budget of DepEd. In time of the hearing, thousands of teachers under the banner of the ACT held a Grand lobbying for salary increase of public school teachers and non-teaching personnel. 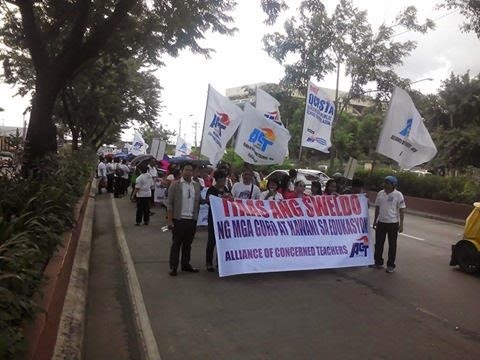 Teachers to legislators: "We are not carabaos, time to increase our salaries now." "Teachers and employees are still underpaid despite our overworked status. We believe that just, decent and living pay for teachers is a factor that can help us in improving the quality of education in the country," ACT said. "We believe that an increase in our salaries is not too much – we rightfully deserve it given the nature of our job and sacrifices we are doing for the Filipino youth. If the government sees us as the country’s heroes, they should give us what is rightfully belongs to us," ACT added in a statement. Currently, teachers are paid a minimum of P18,549 a month, but House Bill 245 filed by Tinio proposes to raise this to P25,000. 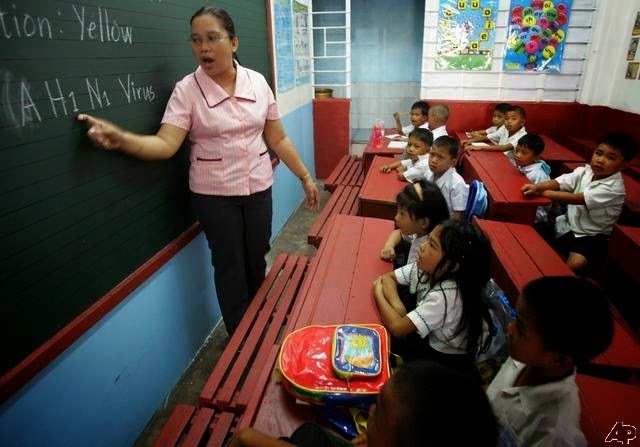 Even the minimum pay of non-teaching personnel will also be raised from P9,000 to P15,000 a month under the proposal. Based on DepEd records for acdemic year 2012-2013, there are 377,831 public elementary school teachers and 169,743 public high school teachers in the country. Luistro said that DepEd is "very supportive" of any increase in the salary of teachers within the budget of the administration. DepEd is seeking a P364.9-billion budget for 2015.